Information about the book 'El Toque de Candombe', by Uruguayan musicians Hugo 'Foca' Machado, Willy Muñoz and Jorge Sadi, its contents, samples of its scores and of the CD. 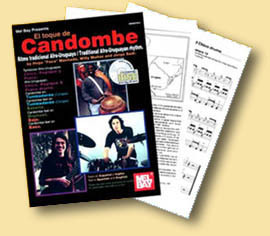 El Toque de Candombe is a bi-lingual book (Spanish and English) devoted to this Afro-Uruguayan music. It teaches the Candombe rhythm on the traditional drums (the Chico, the Repique and the Piano) and how the rhythm is produced with Congas or 'Tumbadoras', bass and drums in Candombe song, Candombe Funk or Candombe Jazz styles. It is a complete study course of 48 pages, with 95 examples recorded in scores with standard musical notation, each with its corresponding track on an audio CD. The CD was especially recorded by the authors of the book. It should be noted that the drums used in the recording were authentic items produced by local craftsmen. All drumming styles with hand and drumstick are covered, including basic patterns and variations, the sum of the individual patterns making up the Drum Corps ensemble. The Candombe Beat was edited in the United States and is distributed internationally by Mel Bay publications, Inc.
Based on the book, the authors also developed a musician's clinic and a musical workshop for schools. Contains extensive information and photos on the origins of Candombe, the Comparsas, Drum Corps, Afro-Uruguayan drums, drumbeats and the rhythm key ( the madera). Covers the folk music style of Candombe and its Afro-Montevidean drums (Chico, Repique and Piano) and Percussionist Hugo 'Foca' Machado goes through the beats - drum by drum - explaining with rhythm patterns which he gives as examples the different variations and their role in the Drum Corps ensemble. (With photos of the drums). Willy Muñoz covers the Candombe beat on the drumset, based on the rhythms of the traditional drums and developing different options for the drummer. Jorge Sadi completes the rhythm section showing classic styles and his new ideas for the bass player. Copyright © 1999-2002 Chas Chas Producciones.